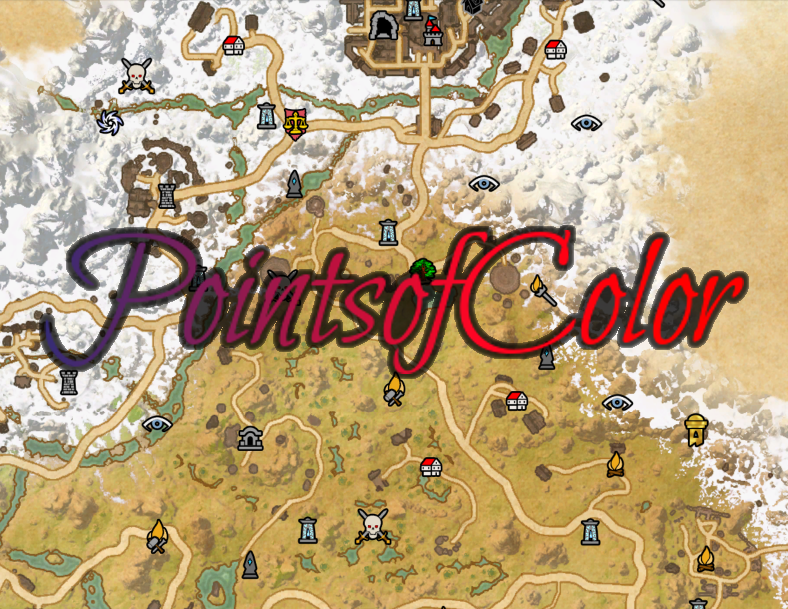 This addon is a recoloring/retexturing by-hand of the Points of Interest (POI) icons shown on the maps. I am able to focus quicker and easier on colors rather than shapes. 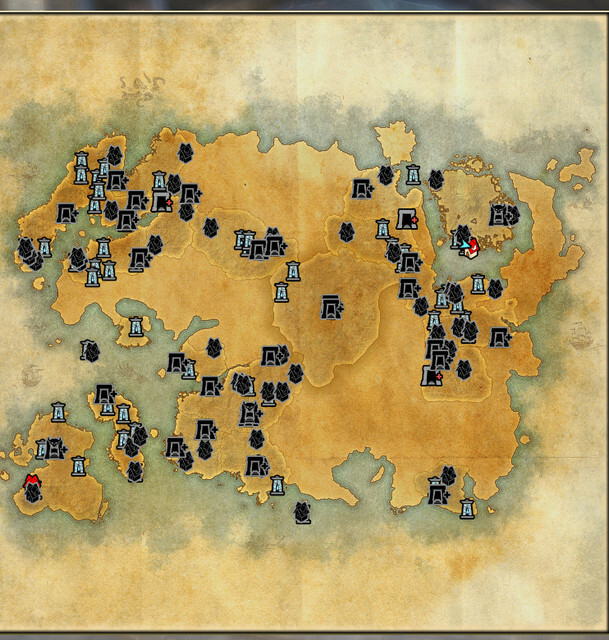 The map can become very cluttered with many black-and-white shapes that make it difficult to find what you are looking for. I really think this add-on improves the look and feel of the maps and goes beyond just coloring. Please, give this addon a try and I don't think you'll be able to go back to the normal map. This is a recoloring and retexturing of the game's texture so there is no performance impact and will continue to work as new areas are added or moved by ZOS. Only new textures will have to be addressed in the future (new craft types, etc). This does not paste new icons at specified coordinates on the map to replace or lay over the game's icons. 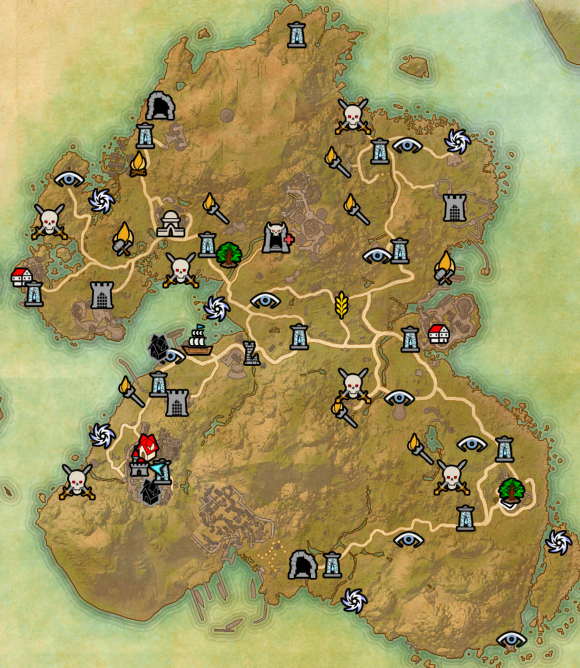 2.34 2019-04-15: API bump for Elsweyr. 2.33 2019-03-02: Added some textures to the player housing icon. Instead of just plain red and white it has a bit of a tile texture, a wooden door texture, and off white color. 1. Added zone story quest icon. 2. Added option to use less color saturation icons. I reduced the color saturation of all 140+ icons by about 25%. This setting is found on the options menu. The game will need to be completely reloaded for the change to take effect. 1. 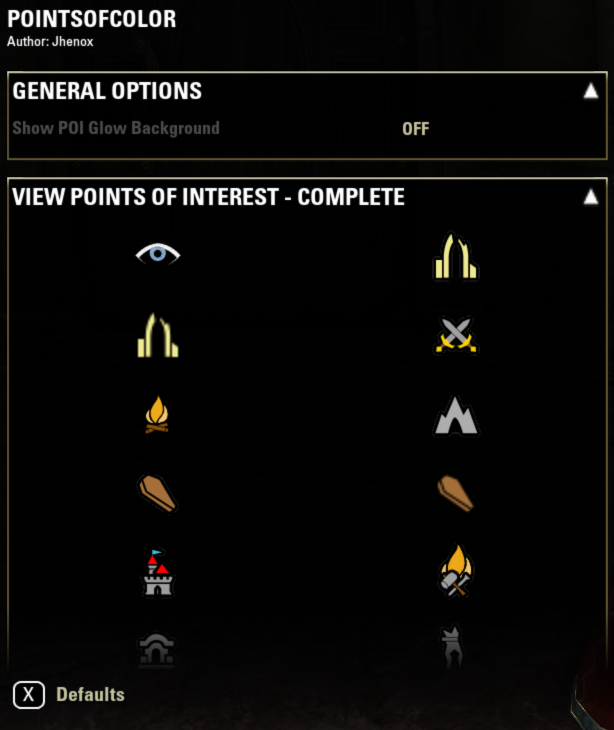 Added the lorebook icon for the zone completion menu. 1. 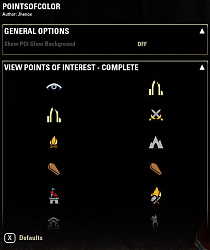 Added the skyshard icon for the zone completion menu. It was still using the delve (torch) icon I had been testing with. 1. Added the new zone completion icons that I already had available. I will still redo the three icons that I haven't done yet. 1. Made some of the functions local. I wasn't very careful with scope. 1. Made some small changes to the complete/incomplete dock (anchor) icon. Reduced the size of the "stock" so it wasn't as wide and large as the "flukes". Thank you, Google. 2. Darkened the eyes of the Undaunted enclave monster head icon to a darker red to contrast more with the mask. 2.15 2018-10-22: API bump for Murkmire. Redid the Undaunted enclave icon (the monster head). A couple tiny tweaks to dock anchors. 1. Made the dock anchors a little smaller. 2. Changed the dock anchors texture. 3. Tweaked the ships slightly. 4. Darkened the unowned house icon to be the same as all other undiscovered/incomplete icons. Added sailing ships! There are actually two types of locations that were using the anchor icon; points of interest (locations you discover like docks) and service points where you take a boat to another region/zone. I made sailing ships to replace the anchors used for the service points. Shipshape and Bristol fashion! Completely redid dock/anchor icon. The default one was pretty poorly made. Hopefully this new one isn't too dark. I was going for cast iron so it's purposely dark but, please, let me know if this affects visibility. 1. Redid the battlefield icon (crossed swords). Steel blades, gold cross bar and pommel, and leather grip textures. 2. Redid cemetery icons (coffins). Wood textures. 3. Redid mine icons (crossed pick axe and axe). Steel heads and wooden handle textures. 4. There were a handful of 32x32 icons. I've made these 64x64 since the game if/when these are used displays them as 64x64 anyway. 5. Corrected the mine icons. I accidentally named the 32x32 version as the 64x64 version so the game was loading the 32x32 and blowing it up so it looked especially bad. 2.7: 2018-09-22: Playing for Keeps! 1. Added rock wall textures to towers/keeps for normal and group versions. 2. Added rock wall textures to tower/keep ruins for normal and group versions. 3. API bump for Murkmire. 4. Tiny imperceptible tweaks to wayshrines. 1. Improved the ayleid ruins icons. I was going for ivy/moss covered ruins. 2. Made some minor tweaks to the wayshrine icons. I shifted some of the runes slightly to curve a little with the shape of icon. 3. Removed an errant pixel on the dolmen/geyser icons. There was a blue pixel outside the outline. Improved the dwemer ruins, respec shrines, and vendor scales with brass/gold textures. I left the dwemer ruins a little bit darker and brightened up the shrines and scales to look more golden. Added color to the ropes on the scales and transparency between the ropes. Changed the stable horse icon to more of a chestnut instead of a palomino to help with visibility. Gave the eye a tiny (almost invisible) amount of color. Darkened the edge between the mane and the coat. 1. Some tweaks to the inn icon. Centered the bands better, darkened lines, increased the band size at the base, made inside of handles transparent. 2. Improved/redid the bank icon. Some small tweaks to the inn icon. Darkened the lines a bit around the wooden tankard body and brightened the foam a bit. A small update with a makeover for the inn service pin using ideas from fgoron2000. Thank you! I was going for a 'right proper' wooden tankard. I used a cherry wood texture for the body then toned it down to a brown. The bands, base, and handle were silver but I toned it to a pewter. The beer foam I sampled from, well, beer foam. 1. Added in the beginnings of an options menu. This is intended to be a starting point for adding additional features. Use '/poc' as a shortcut to get to it. 2. Enable/disable the glow background on wayshrines and dungeons. Default: off. 3. View/browse through all of the current icons. I was intending this to be where individual PoC icons could be disabled if people preferred the default icons. That functionality hasn't been added but, for critiquing or curiosity, you can view all of the icons. 4. I set the tooltip for the images to be the filenames so when/if you see things that need work then you can refer to it by name. There are a lot of icons I still want to improve. Thank you for using PoC! 1. 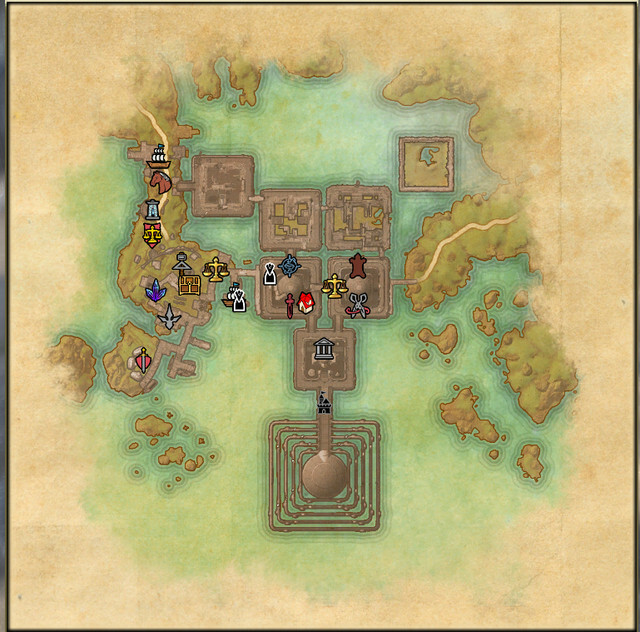 Removed the glow effect around a number of icons; delves, dungeons, group delves, group instances, houses, public dungeons, trials, wayshrines, etc. This was barely noticeable but, in my opinion, made the PoC icons seem more smudged around the edges. I think they look a lot sharper now. 2. Sharpened up the runes on wayshrines so they appear more like runes and not just some weird texture. As always, feedback and ideas are welcome. 1. Painted fence/outlaw's refuge service icon to uniform gray steel color. 2. Painted Thieve's Guild icon to steel color on blood (red) background. 3. Painted trasmutation icon. I sampled the in-game colors for stamina, health, and magicka. 4. Painted happy little trees. The grove icons, hopefully, look better. 5. Painted the enchanting icon. I sampled from a screenshot of a soul gem in the game. I'll post some examples in the Comments. 1. Painted wayshrines. I went with a darker stone color. The light blue on the edges are light blue runes. The center has a wayshrine fire. I took a screenshot of the fire, cut it out, shrunk it down, and put it on. The runes, though they are completely imperceptible, are Dwemeri and spell W-A-Y-S down the left side then H-R-I-N-E down the right hand side. I was going to use Ayleid but I couldn't find a rune for W. I tried white marble textures and gold domes but, if just the dome was gold it looked like a sunny-side-up egg. If I did the dome and the top of the wayshrine then it looked like a sombrero. If you see some strange person staring at walls and wayshrines it might be me. 2. Painted dolmens. I stood under an open dolmen, took a bunch of screenshots, cut it out, shrunk it, then worked it into the game icon. 3. 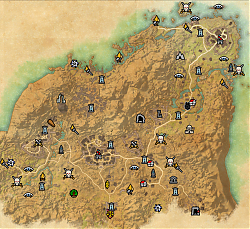 Painted the Areas of Interest icon. Blue iris with eye-white. Thank you, fgoron2000. 1. All incomplete/undiscovered icons have been toned down to a standard gray color. 2. Using a basic palette of colors for material types to keep the colors from being overwhelming; blood, bone, brass, fighter's guild red, fire, fire secondary, gold, horse coat, horse mane, house side, incomplete/undiscovered, light wood, mage's guild blue, plus icon, red roof, sky blue (gems), stone/steel, stucco, water, wood. 3. Dwemer ruins now colored as brass. 4. Stone structures (caves, towers, crypts, gates) now have a standard gray color. 5. Steel items (swords, sewer grates, tools, etc) now have a standard gray color. This is the same as stone. 6. Colored some service POIs. 7. I kept the trophy vault icons in Imperial City a single color but unique from each other for visibility. Some remaining structures I don't know what to do with are wayshrines, points of interest (the eye icon), dolmens, and ayleid ruins. For now these are just a unique color for visibility. Some service pins still need attention. 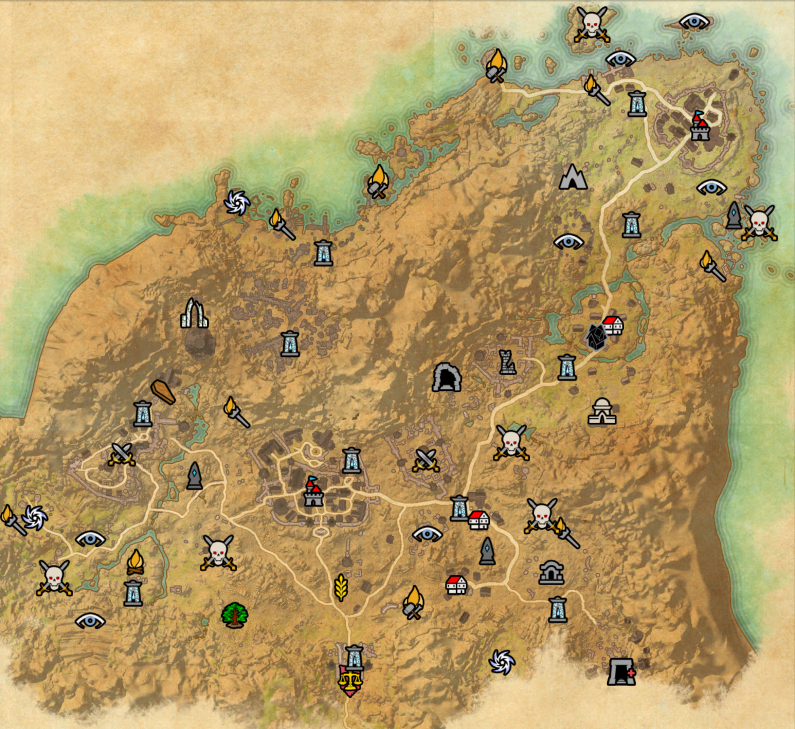 Added more multicolor POIs; delves, raid dungeons, crafting locations, blacksmiths, etc. This is still an ongoing process. 1. Colored the housing icon. This was the first texture that I used multiple colors on. It looks good, imo. 2. Fixed the mine texture. ZOS uses a misspelled texture (compete instead of complete) so I needed to use the misspelled name. 3. Updated the mine texture to use multiple colors. 1.1: 2018-08-10 Colored the service Points of Interest. I still need to color player housing. Am I just unlucky or are there any specific reason I'm not seeing any icons in Thieves Den in Hew's Bane and some off-set in Dark Brotherhood Sanctuary, Gold Coast ?? Thank you for that information. I'll see how it works with PoC. Thank you for your different screenshots, that's really nice. I personally agree that a 50% saturation reduction is a bit much. But I think 25% is not enough. So, personally I'll try something like 35% (or maybe 40%…). Anyway, I've been saying "personally" because I was talking with a friend about that, and in his opinion, 50% reduction is not enough. So… I don't know if it's possible for you to easily add multiple (de)saturations settings, but I guess it's the way to do so that everybody's happy. Adding more steps would be madness if there is no easy way to do it. I've just found that there is a "SetDesaturation(number desaturation)" function that maybe would be nice to use, if that is possible to implement it in your code. Last edited by NTak : 03/11/19 at 04:59 AM. That is great news! It also gives me another idea of things to check when someone is having trouble. Thank you! I GOT IT TO WORK i was just using the normal unzip. it started to work when i used 7-zip to extract it. ya i was doing it all manually. oh sorry yea the maps reruns to normal when i delet the unzip folder of it in my addons when the game is off. i still a bit new to makeing comments on the site so i not sure how to put images in replys. Last edited by Jhenox : 03/03/19 at 12:29 PM. I never heard back but can you confirm that, when you completely disable/uninstall PointsofColor that your map icons work normally? You haven't given me much to go with other than "It's broke.". Screenshots? Description? I almost feel trolled. Ugly is because all of the dungeons you haven't completed and houses you don't own. 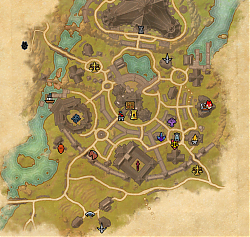 Use something like HideHousePreviews on World Map, for example, to hide all the grayed out houses. Also, work on your manners and communication skills. Last edited by Jhenox : 03/02/19 at 04:56 PM. What am I supposed to be seeing here? I can't tell if you're trying to be snarky or complimentary. I assume snarky based on viewing your previous posts to other addons. Last edited by jycs : 03/02/19 at 04:37 PM. I redid the color saturation to only 25%. Please, let me know if it should be more or less. It looks very close but is definitely reduced when looking at them side by side. Thank you. Last edited by Jhenox : 03/02/19 at 04:32 PM. Last edited by Jhenox : 03/02/19 at 04:51 PM. Hello. I added an option for half color saturation icons. Is this too much or not enough? Personally, I think it is too much. Thank you. Reduced color saturation by 50%. Would it be easy/possible to add an option to choose the colors saturation ? Why am I asking ? I do like the colored icons idea, but it makes me feel like in an old video game with the "flashy" colors. Anyway, great work on that addon. Last edited by Jhenox : 03/02/19 at 02:25 PM.